When it comes to refinishing, we believe you deserve the highest quality and the best value. 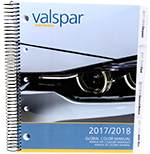 That's why we are continually working to improve the performance of every Valspar product. It's also why Valspar Refinish is the most cost-effective brand on the market. We're here for you -- from primers to clearcoat, you get nothing but our best.